The range of single roll crushers available from SISCO are designed for the primary reduction of Coal, Lignite, Coal, gypsum, Shale, Slate, Oxide, fireclay, Salts, chemicals, Phosphate rock Lime, Ceramic Clay, Bone, Graphite and other friable materials. All machines are provided with automatic mechanical overload and are ideally suitable for choke feeding. 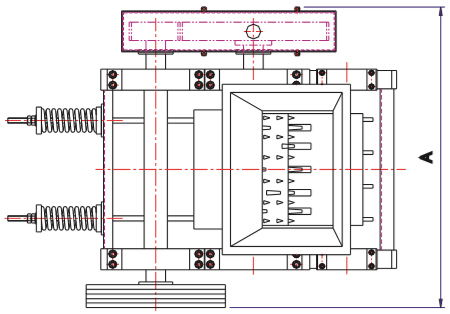 The design of the crusher is extremely simple consisting of a heavy welded rigid box type frame which will stand the most severe service: crushing roll and breaker plate are mounted in the frame. The breaker plate is hinged at its upper end and held in position by a pair of adjustable tension rods at the lower edge by means of which the clear opening between the breaker plate shoe and the surface of the roll can be varied to give a range of product sizes. The breaker plate is fabricated from a heavy steel plate and provided with wear resistant renewable bolted liners. The breaker plate itself can be easily removed from the top of the Crusher. The heavy spring on the tension rod cushions the Crusher againast severe shock. Crusher Roll drum is a heavily built and is keyed on a large steel shaft. Renewable cast manganese steel crushing segments are bolted to the drum. 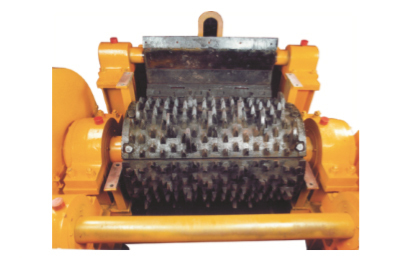 Single roll crusher is equipped with segments having long feeder teeth at proper intervals and various shaped short teeth covering the entire surface. The long teeth not only acts as feeders but very positively grip the large pieces which readily enters deep in to the maw of the machine where the smaller teeth make the proper reduction with a minimum amount of slack. The segments are bolted to the convex surface of the drum so as to completely cover it. This forms a very durable and satisfactory crushing surface. By removing the cover plate and hand hole cover plates access may be had to the bolts and the worn out segments removed and new segments fitted without disturbing either the roll or the hopper. This is very convenient particularly when the Crusher is installed below the large hopper and chute. The breaker plates and crushing roll are mounted on large diameter steel shaft together with the counter shaft. They are carried in heavy duty roller bearings. A heavy Flywheel is fitted for the V-belt drive from a squirrel cage electric motor. 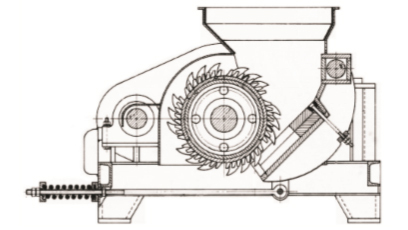 From the Flywheel, the drive is imparted to the roll drum through a counter shaft and machine cut reduction spur gears. A fabricated steel guard is fitted with the gear.